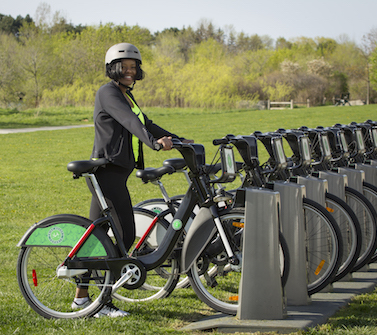 Whether you're commuting, running errands or sightseeing, Bike Share Toronto is a fun, flexible and cost-effective way to navigate the city. Buy a pass or become a member to access 3,750 bikes and 360 stations across 75 square kilometres of the city. Locate a bike at one of our 360 stations across the city. See bike availability on the System Map or mobile apps. Take unlimited 30 minute trips while your pass or membership is active. After 30 minutes, overage fees apply. Return your bike to any station. Slide the bike into the dock and wait for the green light to lock. Before your 30 minute trip is up, dock the bike and unlock another to continue riding without accumulating overage fees. Why join Bike Share Toronto? Annual Memberships cost $99 (plus HST) per year. At only $7.50 per month, that’s less than 30 cents per day! Biking is a fast way to get around the city. With 360 stations around town, it’s even easier than using your own bike. 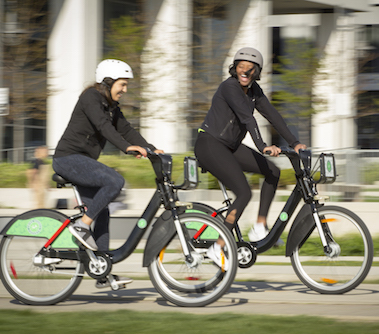 Whether commuting for work or using for leisure, you’ll enjoy Bike Share Toronto for any purpose. Biking is great exercise. Reduce your stress and improve your health. By saving on gasoline, preventing carbon emissions and keeping pollutants out of the air, biking is not only good for you, but also good for the environment. 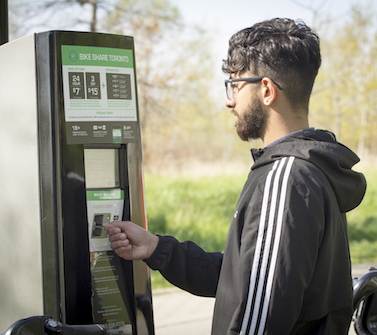 Purchase a Single Trip, Day Pass or 3-Day Pass at any Bike Share Toronto station kiosk or mobile apps.